Hello again everyone today ! On 30th of last year ! 2013 that is ! I received a big parcel again when I was returning home from somewhere ! I just then I thought That it must be the parcel i had been waiting for ! 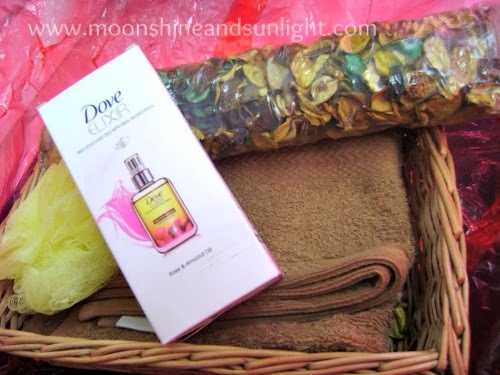 The dove elixir giveaway goodies ! This giveaway was held by Ritu Rajput of www.theindianbeauty.com ! And I can't tell you how excited I was about the giveaway even before being one amongst the lucky three ! :) and a big thanks to her ! 4.The bottle of lavender oil ! And in a weaved cane basket !!! Cool stuffs. Glad you got them. yup !! they are really cool!